SCVHistory.com LW3180 | William S. Hart | Winifred Westover Stars in 'Anne of Little Smoky,' 1921. Twenty-two-year-old Winifred Westover stars as the title character in "Anne of Little Smoky" from Wisteria Productions/Playgoers Pictures, 1921. 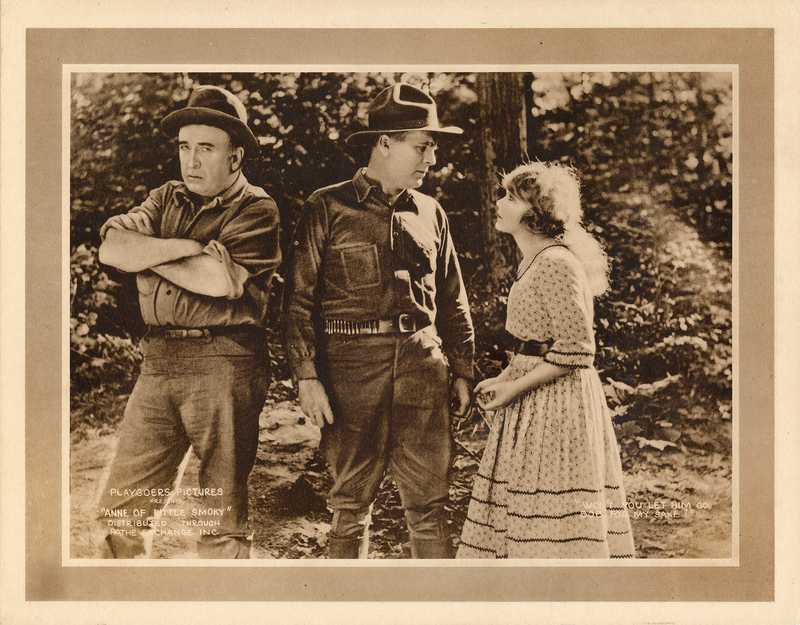 Sepiatone 11x14-inch lobby card, which was the standard for lobby cards from 1919-1921. The film was released November 20, 1921. Just over two weeks later, Westover married William S. Hart at his home on De Longpre Avenue in today's West Hollywood. The day before their wedding, Hart celebrated his 57th birthday. The marriage didn't last, but it did produce a son, Bill Jr. (1922-2004). It was the only marriage and the only child for each of them. WINIFRED WESTOVER PROVES OBJECT OF BIG INTEREST IN "ANNE OF LITTLE SMOKY"
"Anne of Little Smoky," the Playgoers feature released on November 20th, is making itself exceedingly popular with exhibitors and public alike, and one of its really big attractions is the personality of its principal character, portrayed by Winifred Westover. Miss Westover, as every newspaper reader knows, is the bride of William S. Hart, who for years was a shining example among the famous bachelors of the screen. "Bill" Hart is so well known to his big following that everybody is taking a neighborly interest in his affairs. They want to see what his bride is like. "Anne of Little Smoky" gives them that opportunity, and it proves to them that "Bill's" long wait before entering the bonds of matrimony did not in the least interfere with his discernment, for Miss Westover is one of the screen's real beauties. 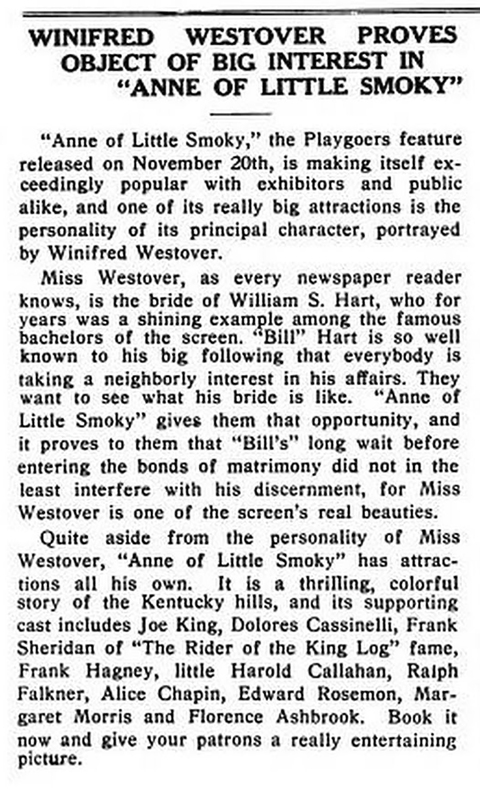 Quite aside from the personality of Miss Westover, "Anne of Little Smoky" has attractions all his own. It is a thrilling, colorful story of the Kentucky hills, and its supporting cast includes Joe King, Dolores Cassinelli, Prank Sheridan of "The Rider of the King Log" fame, Frank Hagney, little Harold Callahan, Ralph Falkner, Alice Chapin, Edward Rosemon, Margaret Morris and Florence Ashbrook. Book it now and give your patrons a really entertaining picture. Silent film superstar William S. Hart appeared opposite the fetching Winifred Westover, 34 years his junior, in Lambert Hillyer's "John Petticoats" (1919). Two years later, on Dec. 7, 1921 — the day after his 57th birthday — Hart left bachelorhood behind and exchanged marital vows with the starlet at his home at 8341 De Longpre Ave. in present-day West Hollywood. Exactly nine months after their wedding night, on Sept. 6, 1922, the union produced a son, William S. Hart Jr.
By that time the May-December romance was long over. The couple separated and spent the next several years in court. Hart devotes no more than a single paragraph to Westover and their issue in his 1929 autobiography, "My Life East and West." Most sources indicate the separation came after just three months; in "My Life," Hart says it was five months, and he provides the date: May 10, 1922. But May 10 was actually the date of a court appearance. The couple had already separated by May 10, when a judge in Los Angeles named C.W. Guerin (Gueren?) refused Hart's motion to stop Westover from fighting the terms of a separate maintenance agreement that barred her from ever again appearing in movies. In September 1922, just days after Bill Jr.'s birth, with divorce proceedings in full swing, Westover's attorney, Milton Cohen, tried to convince the court that Hart once ordered his wife from their home. The Los Angeles Times quoted Hart's retort in its Sept. 17 edition: "If Cohen claims I was physically cruel to my wife, I'll lick him so you won't be able to recognize him. If I can't do that, I'll drill a hole in his stomach so big you can drive a twenty-mule-team borax wagon through it." In "My Life," Hart says Westover sued him for divorce on grounds of desertion. Why the unnecessary and damning concession? Was he implying she couldn't have beat him on a cruelty charge? Or that she couldn't have accused him of infidelity? We don't know. But from his lasting friendships (see the Wyatt Earp letters, for instance) and the intense devotion he felt from his fans (to whom he left everything in the end), we know loyalty was a virtue he cherished — and rewarded. It stands to reason that disloyalty would earn you a swift kick out the door. On Feb. 11, 1927, nearly five years after the couple separated, the divorce became final in Reno, Nev.
Around the same time, construction started on a 22-room hilltop mansion in Newhall that Hart began planning in 1926 as a retirement home for himself and his younger, wheelchair-bound sister, Mary Ellen. It was completed in late 1927. With the passage of time, we tend to forget that William S. Hart was a major Hollywood celebrity, and that then as now, Americans relied on daily newspapers and movie fanzines to slake their insatiable appetite for information about their favorite stars. The only difference is that today, the latest gossip circulates in the blink of any eye through the Internet and TV, and fresh fanzines hit the supermarket check-out counters weekly instead of monthly. Hart was no stranger to the courtroom — or to the cameras outside it, or to those that occasionally managed to follow him into it. Hart, like all others, paid the price of celebrity. He had a personal life but not a private one. It's axiomatic: If you want the publicity that compels people to watch what you want them to watch or read what you want them to read (or vote how you want them to vote), you forfeit the right to stop those same cameras from seeing what you don't necessarily want them to see. This is a crucial point. If we're to understand the profound fealty Hart felt for, and from, his fans, we must view it through the lens of a man whose fans remained true to him even as the press drew back the curtain. The shutters clicked as Hart's marriage unraveled, and they clicked again in 1936 when he took United Artists to court in New York City for breach of contract. He'd made his last film, "Tumbleweeds," eleven years earlier, and he accused the studio of failing to make good on an agreement to promote it. His insistence on "keeping it real," in today's vernacular, had been his undoing; up against newer, flashier Western stars such as Tom Mix and Hoot Gibson, Hart was told as early as 1921 to change his approach or hand over production to someone else. He refused, and Paramount Studios bid him adieu. By 1925, distributors had stopped giving his films as wide a release as the blockbusters of the day; ultimately he sued United Artists over it, seeking to recover the $500,000 in anticipated earnings he said he'd lost. Three years after their court date, in 1939, Astor Pictures Corp. re-released the film and tacked a new, 8-minute monologue onto it as an introduction. Filmed at Hart's Newhall estate, the "farewell" monologue was his only speaking role in a film and his last appearance on the big screen. The shutters clicked again on Aug. 20, 1939, when Hart finally quashed a bogus paternity suit that had haunted him for nearly 20 years. It temporarily interrupted his film career in the early 1920s and can't have helped his failing marriage. The shutters clicked many more times: when Hart's ex-wife sought to renegotiate her alimony; when Hart swore out a criminal complaint against a Newhall man who took potshots at a beloved Great Dane in 1940; and when his sister Mary Ellen was buried in 1943. At the end of William S. Hart's 81½-year life, where did things stand? His acting career had ended 21 years earlier and left him feeling betrayed by studio executives. The sister he cared for and lived with was gone, as were his oldest friends. The only intimate liaisons we know about were fleeting and fickle and provided years of misery. His pinto pony Fritz and many treasured pets rested beneath headstones at the base of a hill below a secluded mansion overlooking a town he rarely visited. The people in his life who hadn't disappointed him were his fans. (Well, except for the psycho stalker who accused him of fathering her child.) They wrote to him nearly every day, and he answered every letter and signed every autograph his fans requested every time he penned a new novel that took him on a mental jouney back to a country that existed the way he chose to remember it. The shutters didn't stop clicking when Hart died. Not by a longshot. Westover and Bill Jr. made their peace with Hart as he lay dying at California Luthern Hospital in Los Angeles, present at his bedside when he breathed his last on June 23, 1946. Soon, mother and son were back in court, the pair having been all but omitted from Hart's will. The actor left his Newhall retirement estate to the people of Los Angeles County (there was no city of Santa Clarita yet); two years earlier he had donated his home on De Longpre to the city of Los Angeles (there was no city of West Hollywood yet). He also gifted $50,000 in cash to each jurisdition so the properties could be properly maintained for the enduring enjoyment of his loyal fans. They weren't his only acts of public generosity. In 1940 he donated land and money for the Newhall American Legion to build the area'a first real movie theater where his films, and others', could be properly displayed. He donated more land and money for the construction of the Santa Clarita Valley's first high school — which the school board decided to name for him, as he learned shortly before his death. He explained his decision to donate his Los Angeles property in 1944: "I am only trying to do an act of justice. I am only trying to give back to the American public some part of what the American public has already given to me." Those who might have been closest to him, Westover and Bill Jr., received no similar justice, and their nearly decade-long attempt to right what they perceived as a wrong came to naught. Westover died March 19, 1978, in Los Angeles. William S. Hart Jr. became a teacher and real estate appraiser in Santa Monica. He retired in 1989, the same year the city of Los Angeles leased the De Longpre property to West Hollywood and transfered the balance of the endowment, now valued at $284,000, to the new city. Bill Jr. objected to the transfer and called for an accounting. Considering how little L.A. had spent to improve the property over the past four decades, by the son's calculations there should have been $800,000 in the bank. He wondered aloud where the money went, but his protestations fell on deaf ears. He died May 13, 2004, in Seattle. LW3180: 9600 dpi jpeg from original photograph purchased 2018 by Leon Worden.